Benjamin Gray, London, circa 1740. 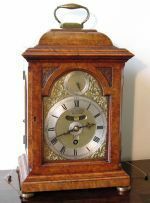 This clock has rare silent escapement and pull repeats the hours and quarters on two bells. 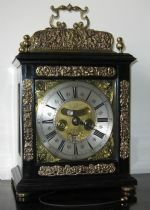 The five inch dial has foliate spandrels, concentric alarm disc with pull wind, calendar, mock pendulum and a subsidiary regulation dial in the arch. 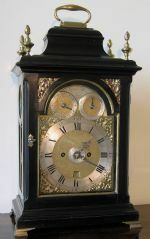 A fine ebony veneered, quarter repeating, basket top bracket clock by Thomas Speakman, London 1700 - William and Mary period. 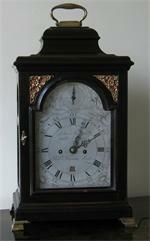 The brass dial has a silvered chapter ring and winged cherub spandrels with a mock pendulum and calendar. 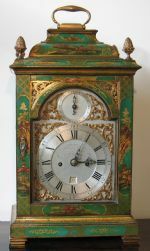 A good George III green lacquered striking table clock by Francis Jersey, London circa 1760. 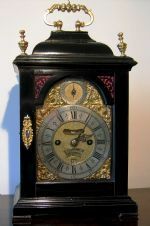 An ebonised fruitwood, bell topped bracket clock from the last quarter of the 18th Century by Robert Newman of London. The moulded door with pierced brass sound frets, the glazed side apertures and rear door all standing on ogee brass feet. Silvered 6 3/4" dial signed Robt. Newman, London with strike/silent subsidiary dial in the arch. Roman and Arabic numerals, blued serpentine hands and calendar aperture . The movement with 5 knopped pillars, twin gut fusee drive and verge escapement striking the hours on a single bell with trip repeat.